We have little doubt that you've already heard of Apple's "next big thing" by now – the iPad Pro and the most impatient among you might even be reading this article on its crisp retina screen, seeing how it has been available for purchase for a day or so now. The iPad Pro is big in every sense of the word. The spacious 12.9 inch screen definitely fits the bill, but so does the eye-watering price tag, starting at $799 for a 32GB Wi-Fi only model and if you are unfortunate enough to reside in Europe, even worse - €899/£679 for a basic one. If you combine the 128GB iPad Pro with a keyboard, it will cost you more than a Macbook Air 13 128GB. 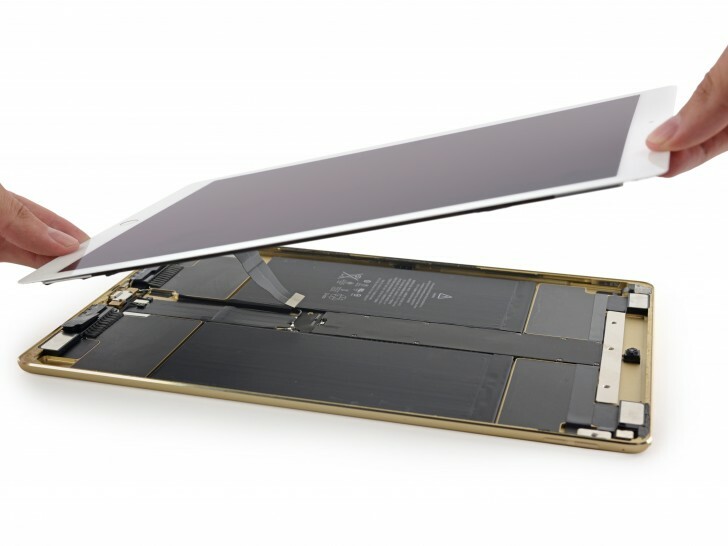 For such a high price, we think it is only fair that we know what is inside the iPad Pro and makes it tick and more-importantly, how difficult will it be to mend it if it stops ticking. 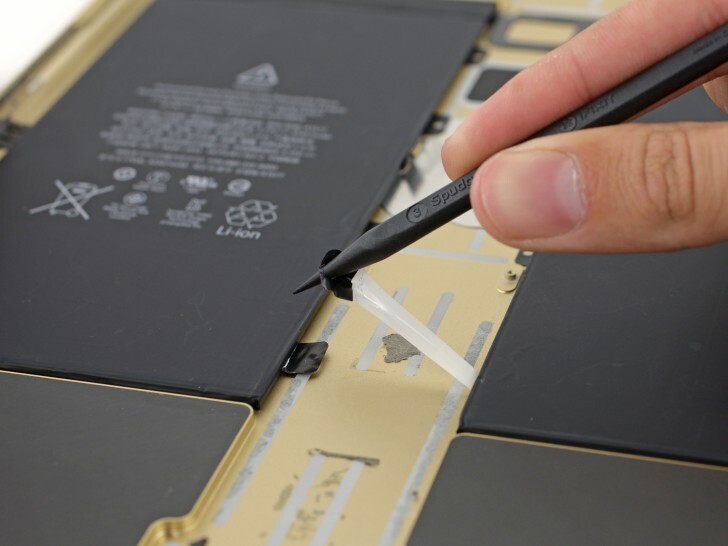 Enter iFixit, who have taken up the task yet again. The end result is a repairability rating of 3 out of 10, which doesn’t sound too good, but is still an improvement within the iPad realm. The iPad Air 2, for example, scored a point less. So, let's dive into iFixit's findings shall we. The iPad Pro is still mostly held together with glue and lots of it. This is a typical trend for Apple tech, especially tablets and it makes tasks like replacing the display a real challenge. 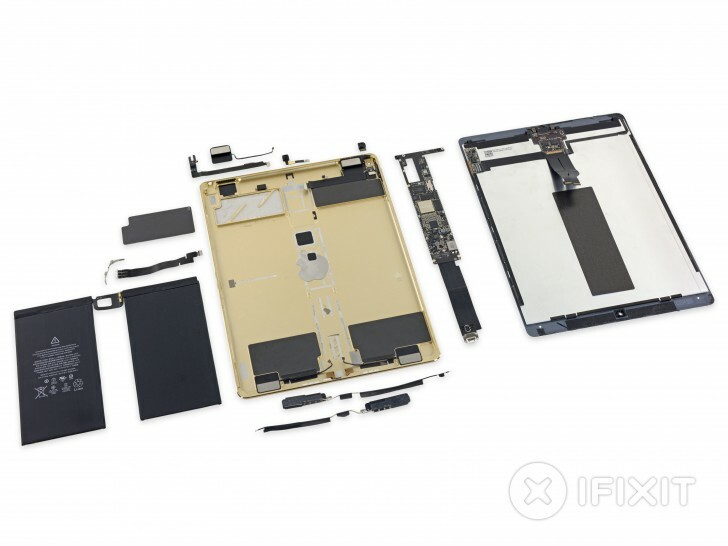 A few other aspects of the iPad Pro's internals, however, seem to be a lot more reminiscent of an iPhone build. For instance, the display is not hinged to an edge of the device, but tethered to the very center. Also, if you've ever seen an iPhone battery getting replaced, then you surely remember the signature adhesive pull tabs that make for a clean and easy removal. Well, they are making a tablet debut in the iPad Pro and its pair of 10.3Ah (38.8W) battery packs. 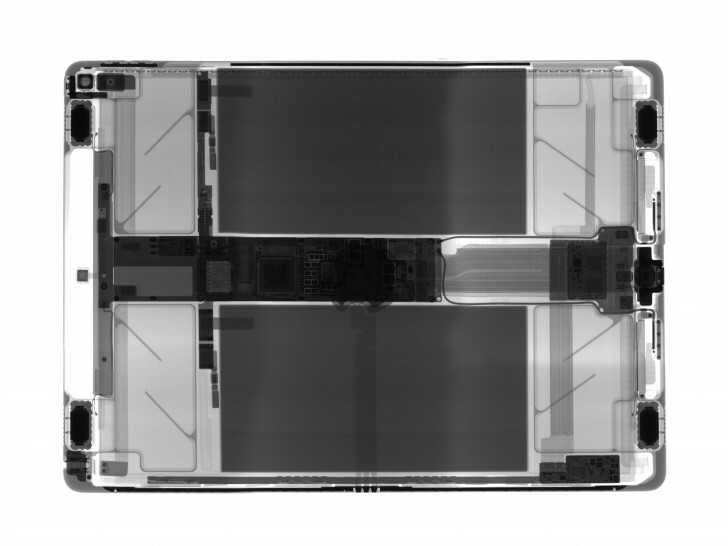 Other details about the hardware that deserve a mention include the self-balanced speakers, which consist of drivers and resonance chambers, actually cut inside the back of the iPad Pro itself – neat! As for some of the hardware vendors, the two 2GB RAM modules come courtesy of SK Hynix and iFixit found their unit had a Toshiba 32GB NAND storage chip. The A9X processor is, of course, labeled Apple. The gyro is an InvenSense MP67B and most of the other controllers come from NXP. You can check the source link for more details and the step-by-step disassembly process, although we hope not many of you will be attempting any teardown procedures at home. You may be right. But I'll be honest, though - these two tablets are not by any means easy to compare. Really, the biggest factor will be which OS is better for YOU. If this is an authorized Apple reseller doing this, contact Apple USA directly. If the reseller doesn't obey, Apple will take their license away.